SAN DIEGO, CA--(Marketwire - March 10, 2011) - South African President Jacob Zuma has delivered his state of the nation address since the last issue, declaring that 2011 will be "the year of job creation" while celebrating the success of the 2010 FIFA Soccer World Cup. With this in mind, African Business Review takes a closer look at the financial benefit the world's most famous sporting tournament had on the South African economy. In this Durban 2020 Signature Edition, we examine whether the city's potential Olympic Games bid would be worth the effort by judging on the impact of last summer's spectacle. We also take an in-depth look at the best ways of raising an online profile in Africa by getting inside knowledge from two search engine optimization (SEO) experts. With the IT African Leaders Summit just around the corner, we also focus on how important the role of technology is in modern business and why failing to successfully integrate your IT department can cost you big. Thinking of doing an Executive MBA course? Or looking to employ the highest calibre employees? Then look no further. We provide an in-depth analysis of the University of Cape Town's Graduate School of Business, which has been voted the continent's best business school for a third consecutive time. African Business Review is a leading digital media source of news and content for C-level executives focused on business and industry-specific news throughout Africa. 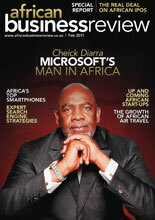 African Business Review is the territory-dedicated arm of the White Digital Media Group. Founded in 2007 by entrepreneur Glen White, White Digital Media retains a diversified portfolio of websites, magazines, daily news feeds and weekly e-newsletters that leverage technology to innovatively deliver high-quality content, analytical data, and industry news. For more information, contact +44 (0)1603 217 556 or visit http://www.africanbusinessreview.co.za/.